The design of a new crate starts with the first ideas and considerations, line drawings and simple hand-made models. This design is refined and optimised by means of downstream processes. The definition of the decoration process (IML, screen printing, multicomponent technology, label, etc.) and the feasibility check complete the design process. At the end of the development process, a 3D article drawing as well as a physical model, which is created using the laser sintering procedure, is available. This drawing and/or the model then provides the basis for the subsequent construction of the injection moulding tool. The mould constructor translates the article drawing into a tool drawing. Due to many years of experience constructing its own moulds, DELBROUCK focuses very intensively on this step. Errors which arise here can only be corrected later with a great deal of effort. The result of the mould constructor’s work is checked as part of tool acceptance. Here the mould is mounted on the plastic processing machine for the first time and optimised until it fully satisfies the requirements of the specifications. Parallel to the acceptance of the tool, the design check of the article takes place according to the rules of the STLB or in line with the customer-specific specifications. A fully equipped test laboratory is available for this purpose. If all the defined tests have been passed successfully, crates are sent to the VLB in Berlin. A further objective test of the crates is conducted here with respect to the required characteristics. The result is an official certificate and the approval for the start of production. 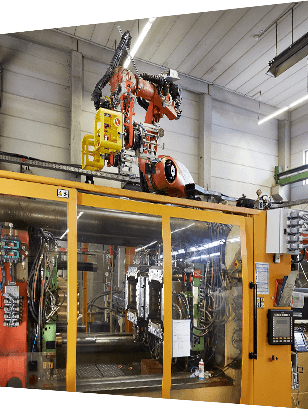 After the tool has been accepted from the mould constructor, it is integrated into the processing machine and adapted to the frequently required automation technology. Depending on the complexity of the project, this step can take 2-3 weeks. It is followed by the start of series production. This is frequently monitored by the customer on site. 7 days per week, 360 days a year. DELBROUCK has for many years implemented a quality assurance system which complies with DIN EN ISO 9001:2008. One part of the system consists of monitoring ongoing production by means of quality assurance in the form of an operator self-inspection. At a higher-ranking level, the QA constantly takes products from production and subjects them to a quality check. 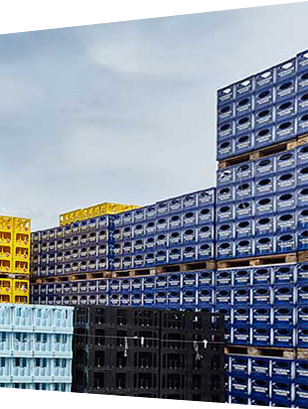 DELBROUCK’s total uncovered storage areas for storing bottle crates amount to 40,000 square metres. Following precise coordination with the customer’s logistics expert, the products are integrated into the ongoing filling processes on a just-in-time basis by haulage firms. A small fleet of the company’s own jumbo lorries is available for emergencies. 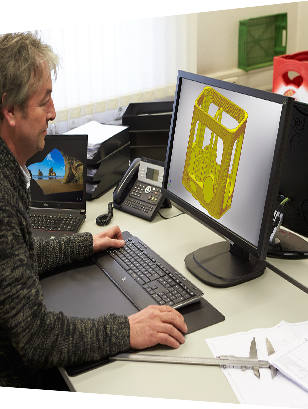 Up until a few years ago, moulds for producing bottle crates were made in the company’s own tool construction department. The knowledge gathered in the past is today used to maintain and repair the moulds after they have been used and to prepare them for the next order. All the processing machines required for this purpose, such as mill centres and EDM systems, are available. In the event of damage, urgently needed spare parts can thus be produced and installed in a very short time.